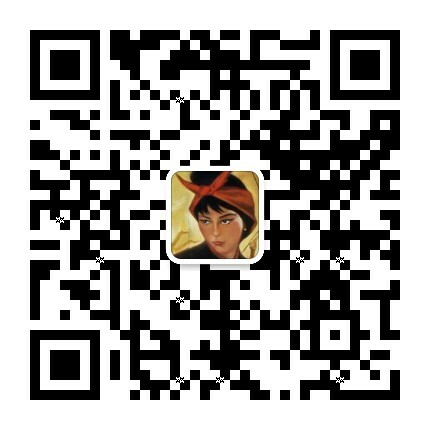 See all entries on Shanghai Russians. See all entries on the old town. 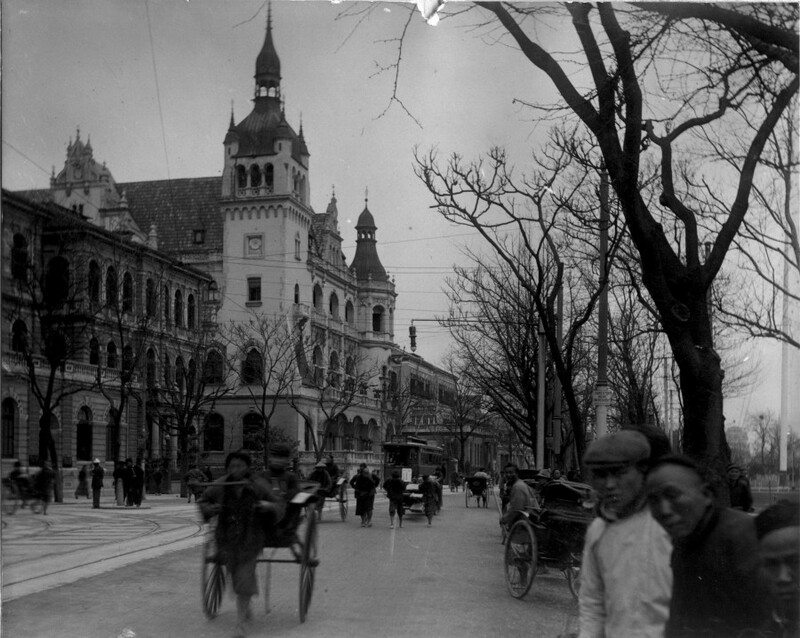 See locations of old photos of Shanghai mapped on PastVu. See all topics or use the Search box on the top right. Read my article on Vladimir Zhiganov on academia.edu. Читать о шанхайской архитектуре по-русски (серия в Магазете). 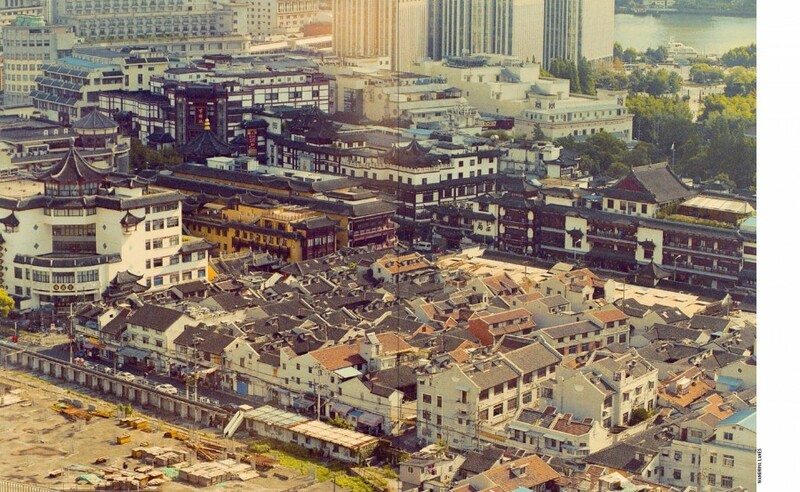 Although the Shanghai Old Town book is finished, there is always room for new discoveries in the old town. 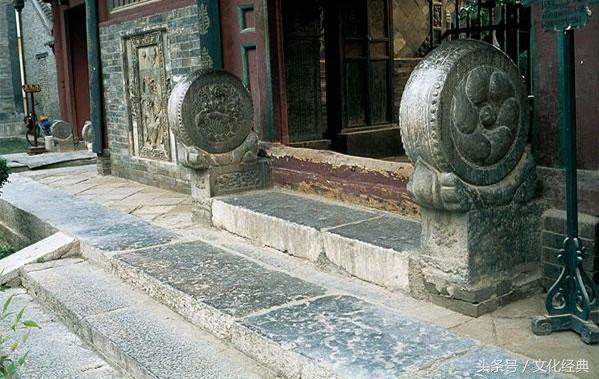 Historic Shanghai's Patrick Cranley took this photo of two drumstones marking the entrance of the Bell Nunnery (Duo'an; 铎庵), once considered one of three most important Buddhist nunneries in the walled city. 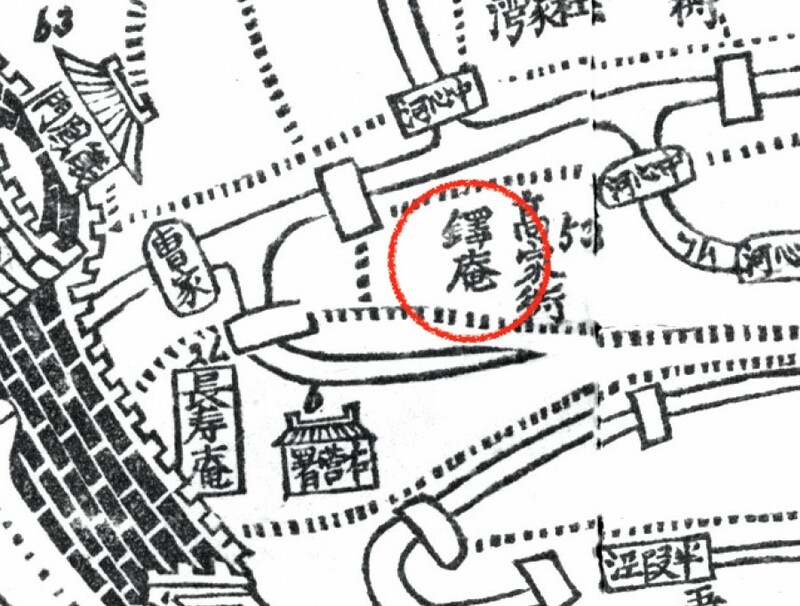 The other two were One Grain Nunnery 一粟庵 nearby and Green Lotus Nunnery 青莲庵 in the north. The pair of decorative drumstones barely keeping their "heads" above the ground, framing the entrance to the long-vanished nunnery, which used to be at 139 Wenmiao Road 文庙路139号. 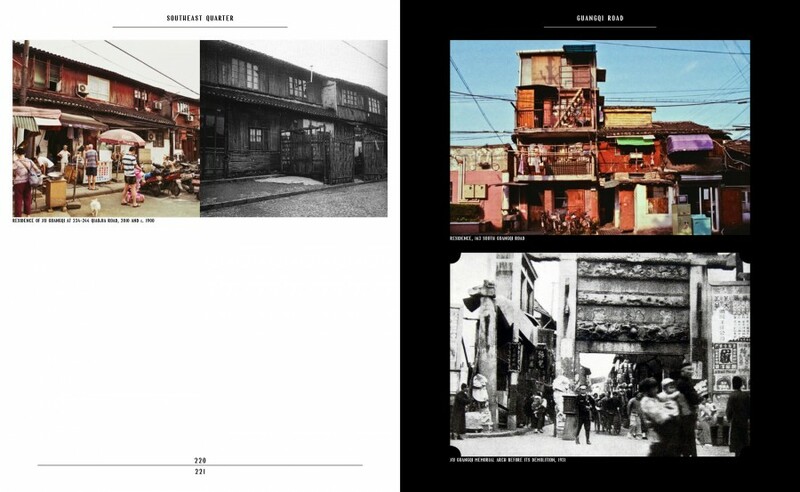 Image: Patrick Cranley, Historic Shanghai. Cao Chuican installed a responsible monk from Jiangxi province to take care of the monastery. The territory behind the bamboo fence was planted with hibiscus and various decorative plants; the halls were well maintained and repeatedly renovated. At that time the area around was not inhabited and resembled a forest. Various renowned Buddhist pilgrims resided at the Bell Nunnery (which makes me suspect this was a male monastery and not a female nunnery, after all). Anyway, the place was considered a scenic spot until the middle of the 19th century. Then, the Small Swords invasion, in 1853–1855, resulted in the destruction of much of the nunnery and it was never properly restored since then. As Shanghai chronicler Mao Xianglin recorded, "The garden is overgrown and the halls are falling apart; hungry acolytes munch on their rice." After the founding of the Republic in 1912, the remains of the nunnery became part of a branch campus of the Municipal Experimental Primary School. During the Japanese occupation (1937–1945) the school refused to report to the Nanshi puppet government and instead went private. In the 1940s, papers reported the few remaining sacred halls were mostly in ruins, wooden effigies gone, yet local residents continued coming to worship at the site. 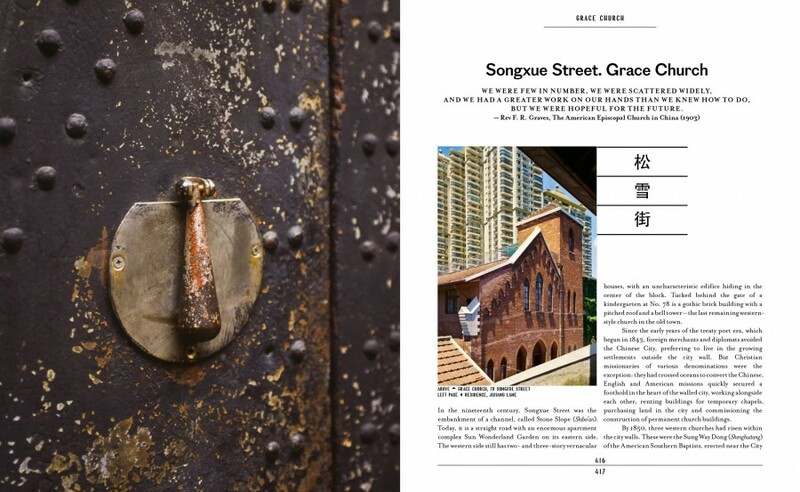 After several modernizations and expansions of the school, all that is left of the Bell Nunnery is a pair of old drumstones, sunken into the ground, at 139 Wenmiao Road 文庙路137–141号 (其实文庙路139号). Three famous nunneries of the walled city on the map from the 1860s. "Old Shanghai is breathing its last breath: old customs have died, old buildings razed to the ground to make way for new, even the old residents have subtly changed," lamented a newspaper article in 1924. 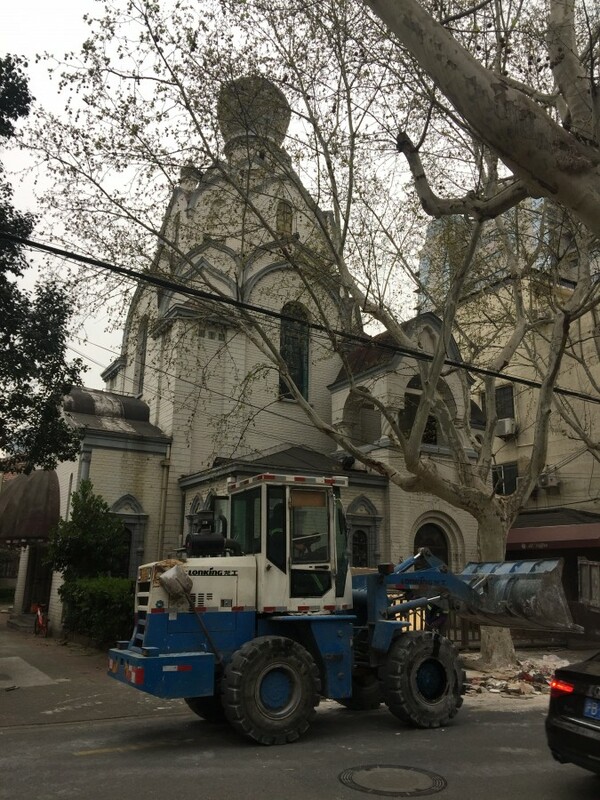 Shanghai has always been a city of change, and some of today's heritage sites demanded the demolition of even older buildings. 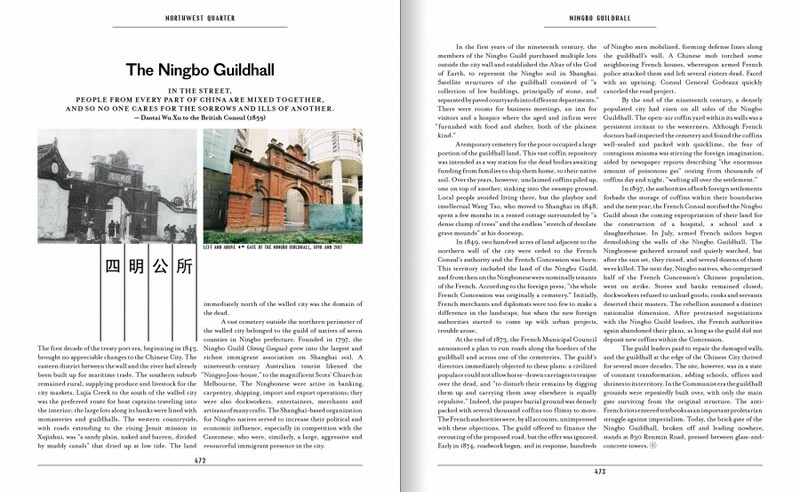 Today we recall three historic landmarks, once integral to Shanghai's landscape and now completely forgotten. Existed from 1924 to 1943 (19 years). Was located on the Bund, at the end of Avenue Edward VII (Yan'an Road). 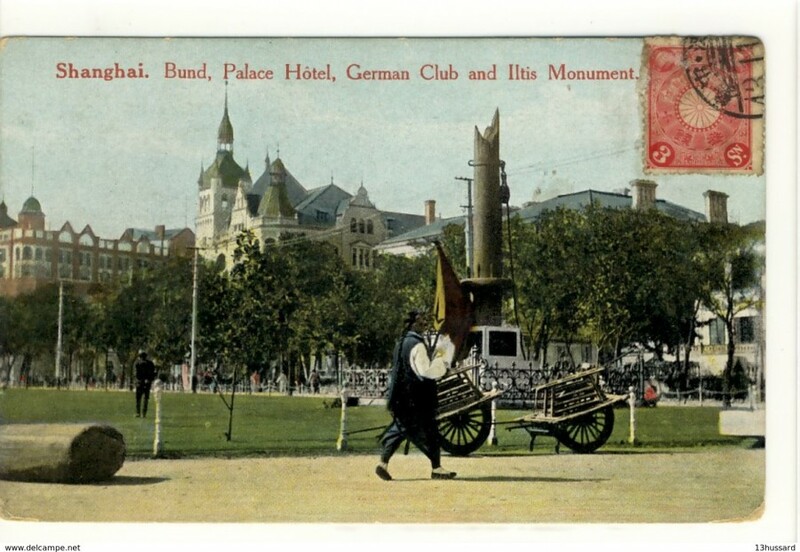 The most iconic postcard view of Shanghai included the bronze statue of the Victory Angel, with its head mournfully tilted, right arm outstretched toward the bend of the Bund; two forlorn-looking children crouched at the Angel's feet. 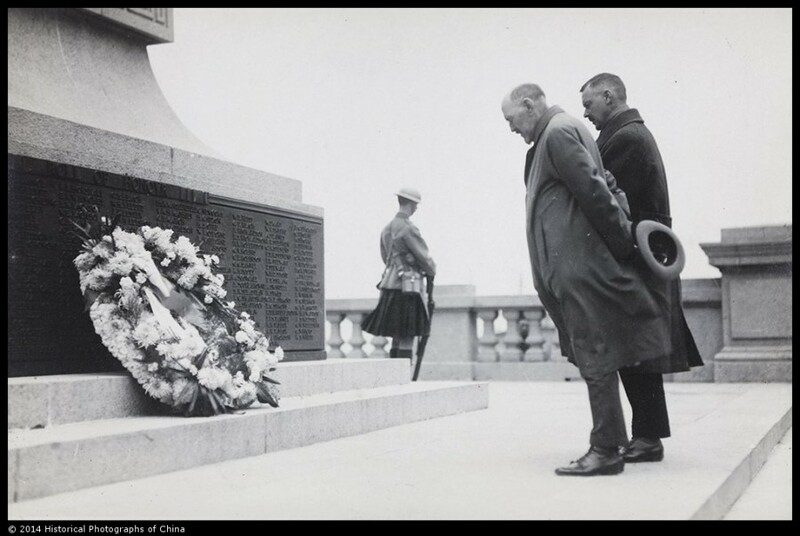 The monument was constructed in 1924 in memory of the fallen soldiers, mostly British, who sailed from Shanghai to the First World War battlefields and died there. The plaque at the base of the monument contained more than 200 names. The monument was designed by the Scottish architecture firm Stewardson & Spence; the bronze sculptures were authored by Henry C. Fehr, and the heraldic compositions and wreaths at the base of the pedestal were the work of the Russian sculptor Isabella Karsnitsky. From the moment of her arrival in Shanghai she worked for the largest design company Arts & Crafts, who trusted her also with the design of the three deities on the tower of the General Post Office. The War Memorial served as the site for the Arimstice Day ceremonies and a starting point for parades, but on normal days traffic policemen had a hard time driving away coolies and beggars who liked to sit in the shade of the massive memorial. Also, visitors complained about the persistent smell of urine emanating from the base. To tackle these problems, temporary fences often surrounded the memorial. 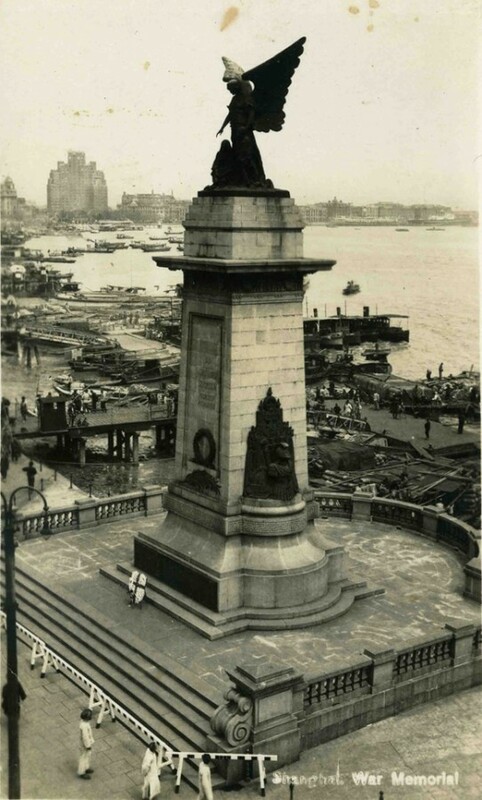 In 1943, when the foreign settlements fell under the control of the Japanese occuying army, the bronze Angel of Victory and all other decorative elements of the memorial were torn down, broken to pieces and sent to a scrapyard, leaving just the empty stone pedestal on the Bund. The same happened to countless garden fences, street lamps, street clocks, grills, gates – and the memorial bust of the famous Russian poet Pushkin installed in the French Concession in 1937. The plan was to send all this scrap metal to Japan to use in weapons' manufacturing, but the Pacific War made sailing from Shanghai impossible, and the vandalized metal parts never left the city. The plans to restore the War Memorial never came to fruition: the settlements were no longer foreign territory, a civil war was raging in China, and the reappearance of a foreign memorial to foreign victims of a long-forgotten European war would seem strange, to say the least. Waterfront in 1923; the scaffolding over the future War Memorial is circled. Image: delcampe.net. The War Memorial fenced off against loitering and vandalism. 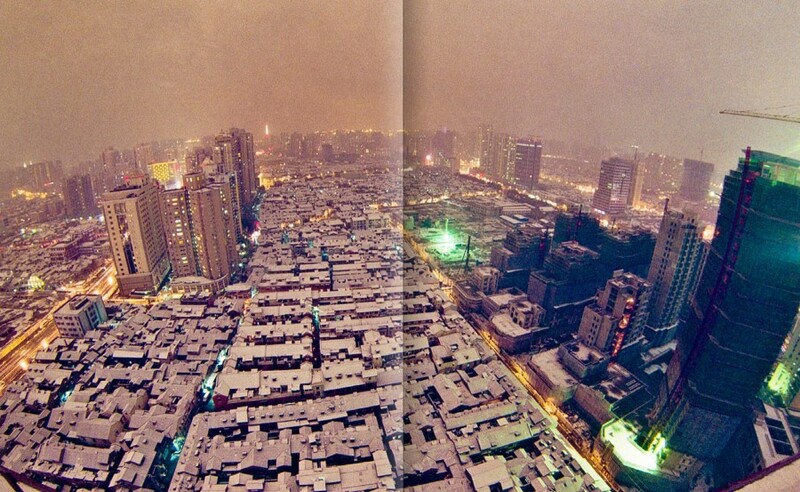 Image: Virtual Shanghai. Armistice Day in 1924. Photographed by Archibald Lang. Image: Historical Photographs of China, University of Bristol. Empty pedestal around 1946. Image: George Lacks; Google Cultural Institute. 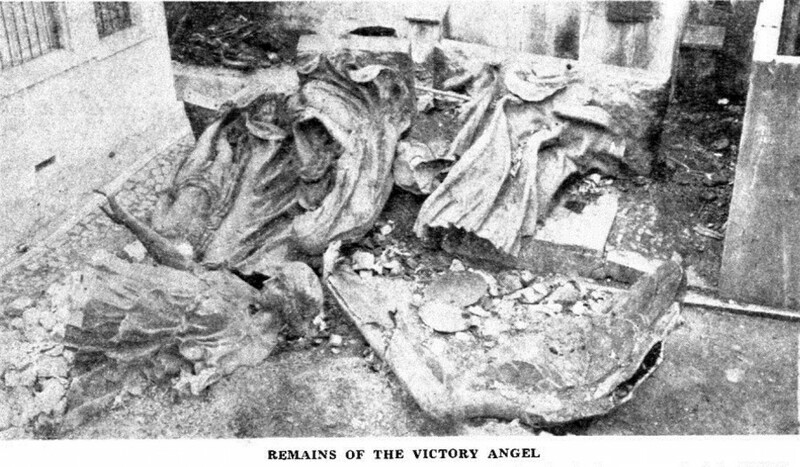 Remains of the Victory Angel in the British Consulate in 1947. Image: NCDN, January 1947. Professor Robert Bickers, who has done extensive research on Shanghai's foreign memorials, found this 1950 poster with a reimagined monument. "Parade celebrating the Founding of the People’s Republic of China (Shanghai) 庆祝中华人民共和国成立游行 (上海)." Image: source. 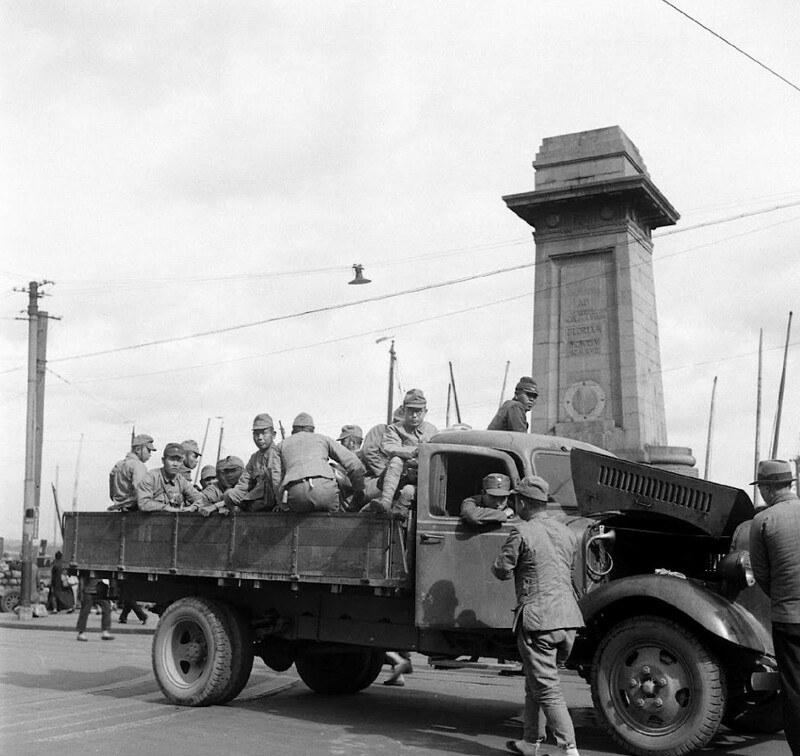 Top: The Bund in 1937. Image: Claude Berruyer. Existed from 1907 to 1935 (28 years). Was located at 23 on the Bund, where the Bank of China now stands. Germans were well represented in foreign Shanghai at the turn of the 20th century and outnumbered only by the British. By 1910 every sixth foreign company was Prussian. 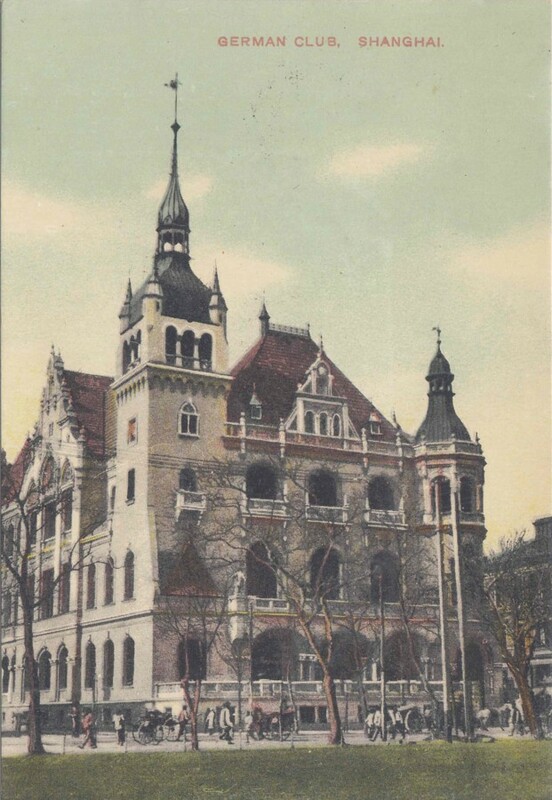 Already in 1900, the growing community began to raise funds and discuss designs of a prospective clubhouse, modeled after the British Shanghai Club, which would be "the largest and the finest" in Shanghai. 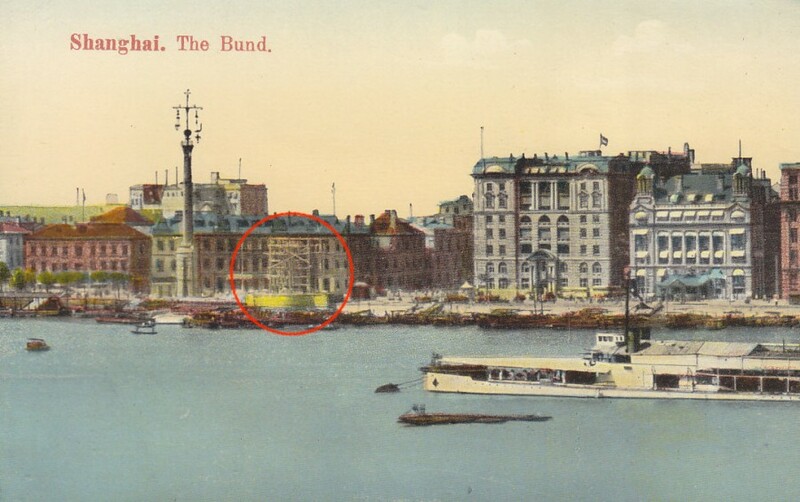 The lot in the center of the Bund was purchased from the English firm Shaw, Ripley & Co., and in October 1904 the Prussian prince Adalbert presided over the laying of the cornerstone of the future German Club. The only concern was that the southern facade of the club would be overshadowed by the new "palatial" building of the Russo-Chinese Bank. However, the architect Heinrich Becker, who designed both buildings, ensured the stylistic superiority of the German Club. 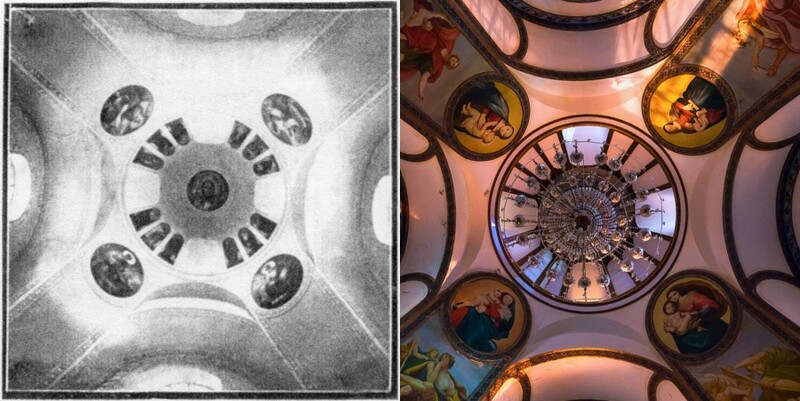 For many years, Concordia was the most beautiful building on the Bund. Reinforced cement was used in its construction – for the first time in Shanghai. For maximum effect, the building was kept under scaffolding until the last day. 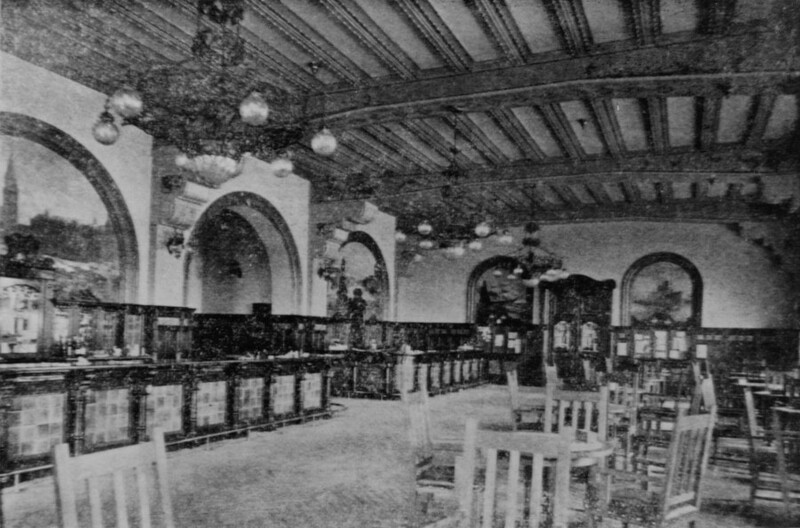 On the opening night, 6 February 1906, even the Shanghai Club was empty of visitors: everyone went to see the opening of Concordia. The elaborate roofline and turrets made the building like a Prussian castle, but to see real luxury one had to go in and be greeted by a huge bust of Kaiser Wilhelm II. Painted views of Berlin adorned the walls, and coffered ceilings had solid beams carved with German folk wisdoms in Gothic blackletter. The dining room offered a panoramic view of the Huangpu River through stained glass windows with pastoral landscape scenes and coats of arms from Prussian provinces. 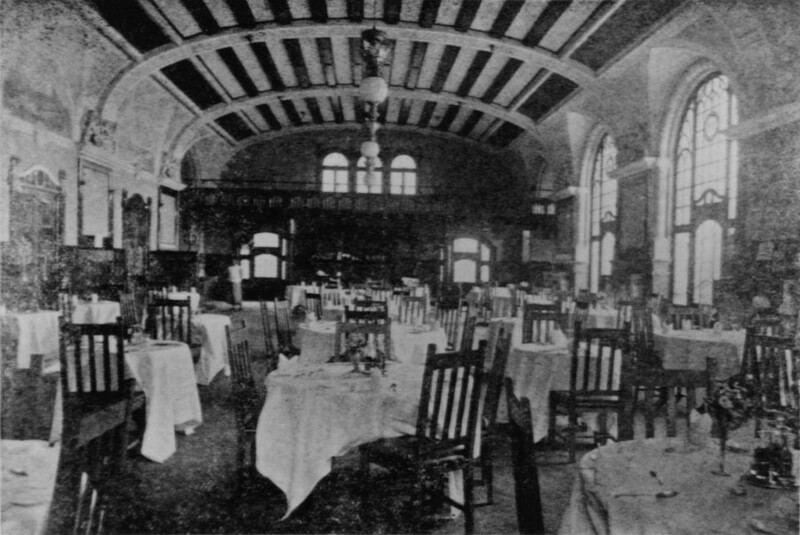 In spite of its nationalist-flavored interiors, the German Club's agenda was light and entertaining. Soon enough Concordia earned the reputation of being the best place for masked balls and yearly bowling competitions. In 1915, however, when the First World War broke out in Europe, the attitude toward Germans in Shanghai forced many of them to leave. Some went to fight in the war, others had to close down businesses, and everyone felt the change in the public attitude. When in August 1917 China at last joined the Entente and declared war on Germany, both German newspapers were forced to close and the doors of the Concordia Club were sealed. There was some deliberation in the English press as to what the building should be used for, but everyone admitted the club now belonged to the Chinese. 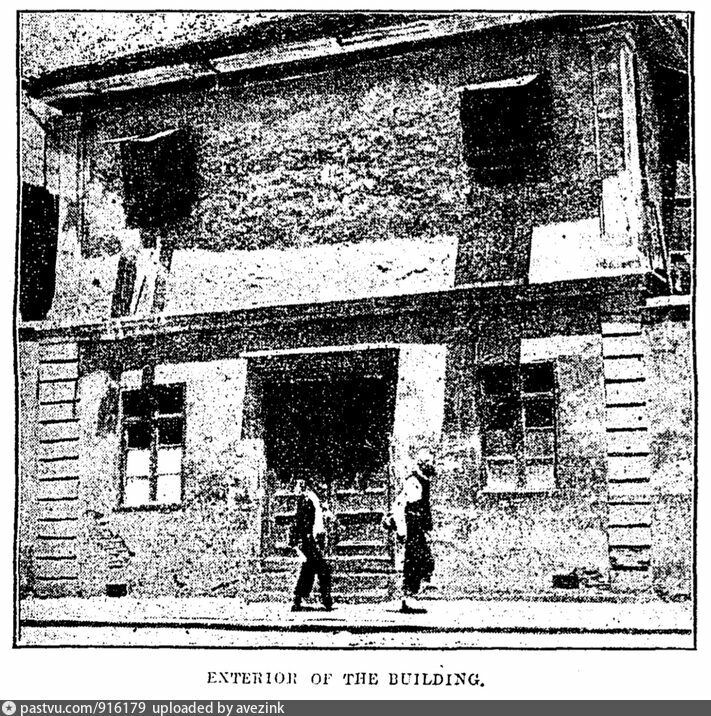 Eventually, the building was passed down to the Bank of China, which had it demolished in 1935 to make way for a skyscraper. Shanghai's German landmarks on the Bund: the Iltis Monument (center right) and the Concordia (left). Image: delcampe.net. 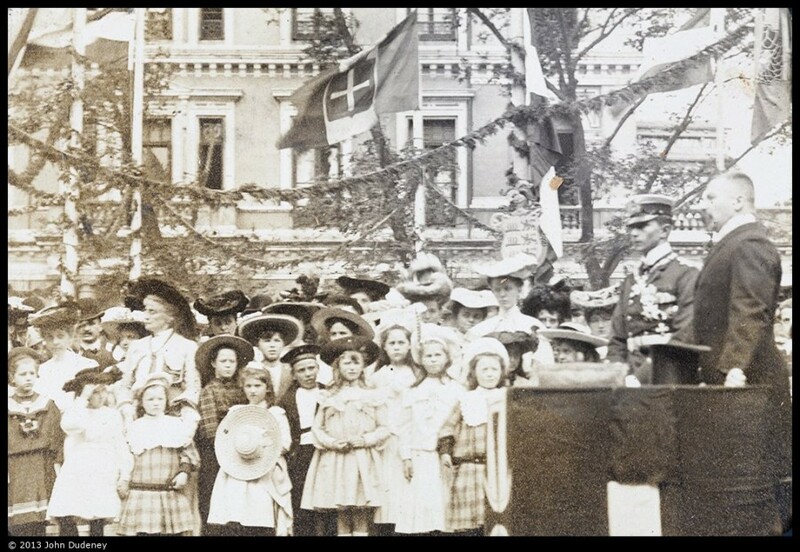 Prussian public at the ceremony of the laying of the foundation, in 1904. Image: Historical Photographs of China, University of Bristol. Concordia around 1910. Image: flickr Fin de Siecle. 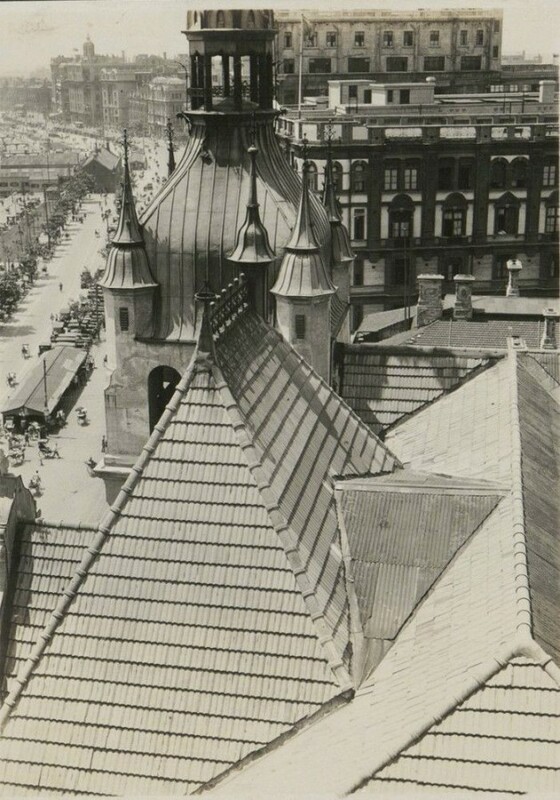 On the roof of Concordia in 1926, looking toward the Palace Hotel. Image: Japanese photographers collection at tuyouhuaxia. Interior of the club. Image: minguotupian.com. 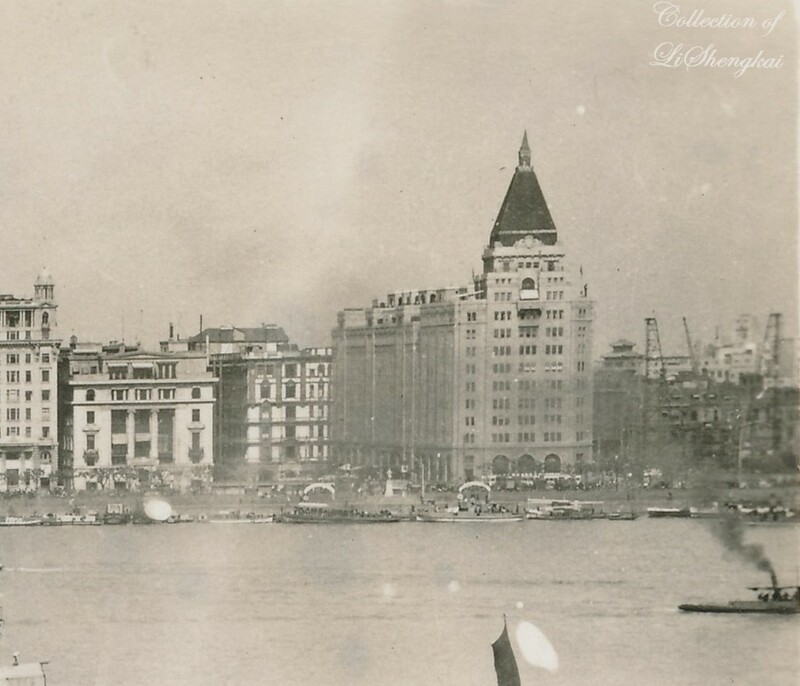 Top: Concordia on the Bund, c. 1910. Image: Francis Stafford, Stanford University. Before piped water came to Shanghai, Chinese and foreign population had to choose between brackish well water or muddy water from the Huangpu, which had to be purified with alum to remove sediment. 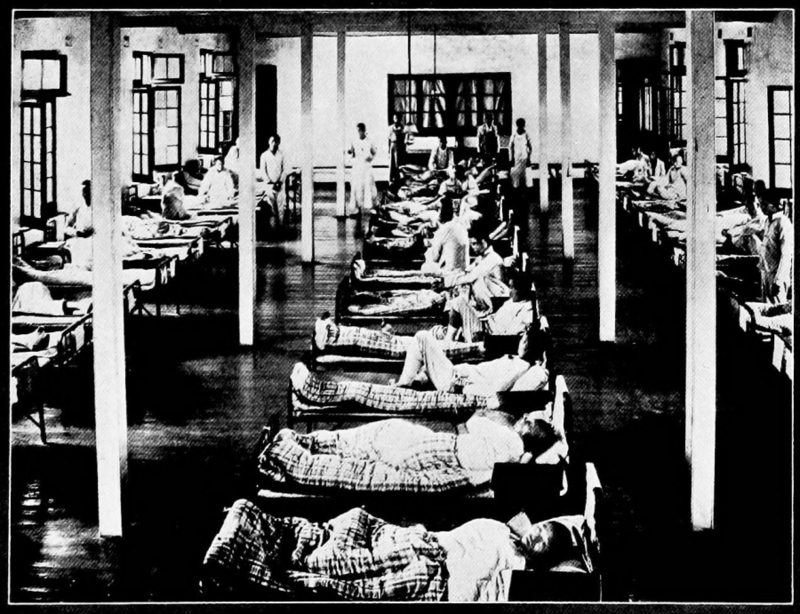 Cholera outbreaks were frequent; disentery was considered a feature of the subtropical climate. But in 1880 the English firm Drysdale, Ringer & Co. started to build a system of underground piping, and in April 1883 the Kiangse Road Water Station started ins operation. It supplied fresh water to all of the International Settlement. 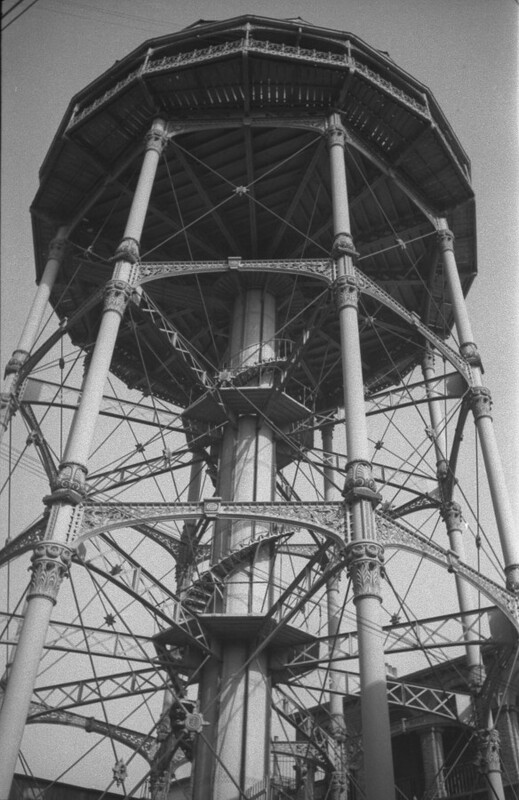 The water tower, 30 meters high, maintained pressure in the pipes and served to store water in case of a massive fire. The intricate wrought-iron construction was easy to see from any part of Shanghai. Around the same time, in 1882, electricity network came to Shanghai and gas street lamps were replaced with electric ones. 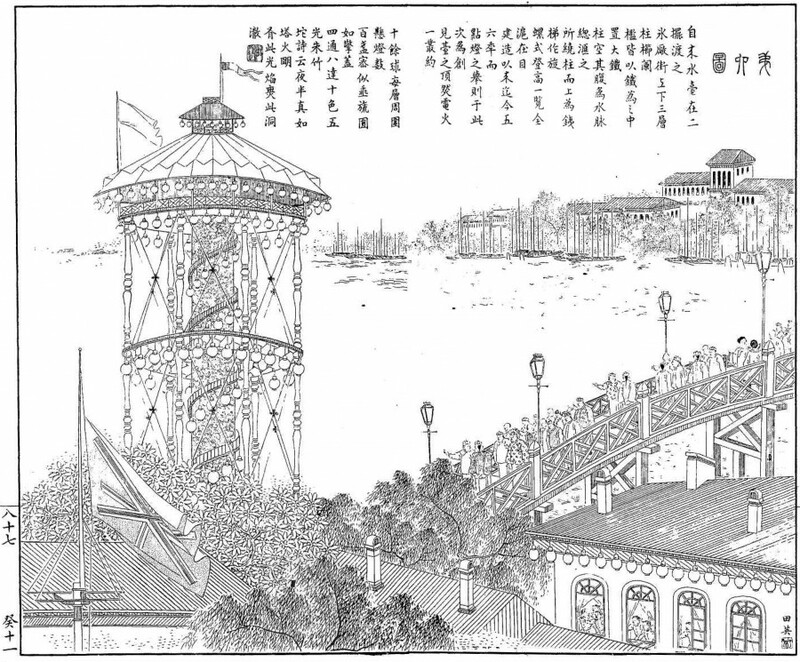 To celebrate the Golden Jubilee of Queen Victoria in 1887, the water tower was decorated with electric lights, and this fantastic and progressive sight – two-in-one – was reproduced as an illustration in the Dianshizhai Pictorial (see the top image in this post). This nod toward progress did little to reassure the Chinese population, many of whom continued to distrust tap water from suspicious underground pipes. There were rumours of drowned bodies floating inside the water tank up above. Even thirty years after its launch, the Kiangse Road Wateworks continued to operate impeccably. In the middle of the 1920s, when London tap water was the benchmark for quality, Shanghai water even surpassed it in purity. The secret was not so much in technology – the waterworks used traditional sand filtering – but the source. 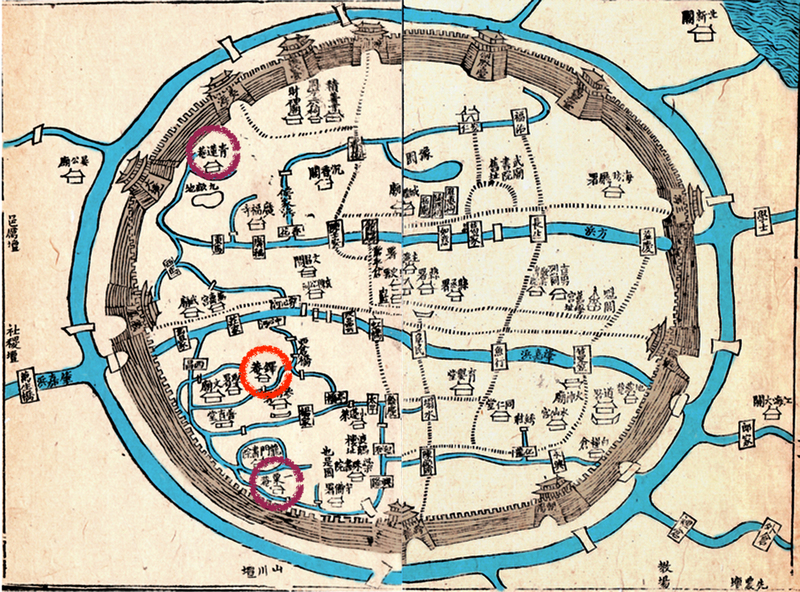 Contrary to the worldwide custom to draw water upstream from the city, Shanghai's water was drawn downstream, at the mouth of the Huangpu, where mighty Yangtze pushed its presumably clean water up the Huangpu. "In China, everything is upside down," remarked the papers. For comparison, Chapei Waterworks, which drew water from the Suzhou Creek, ended up with "liquid dirt" full of cholera germs coming from the tap. By the 1930s, the Shanghai Waterworks had expanded, and there was a giant modern waterworks in Yangtzepoo. Journalists now looked at the old water tower with disdain, calling it "an eyesore on the changing skyline of Shanghai" and likening it to the "buzzard's nest on top of a travelling crane." In 1932, modernist lines were in vogue, and Victorian flourishes must have seemed especially revolting. In spite of this ostracism, the tower quietly survived the age of art-deco, the Japanese occupation and the Liberation, and was pulled down in 1954. Now there is a garage and an office on that corner. Only the Waterwarks Administration building, built in 1888, survives in a much changed form, at 464–464 Middle Jiangxi Road. 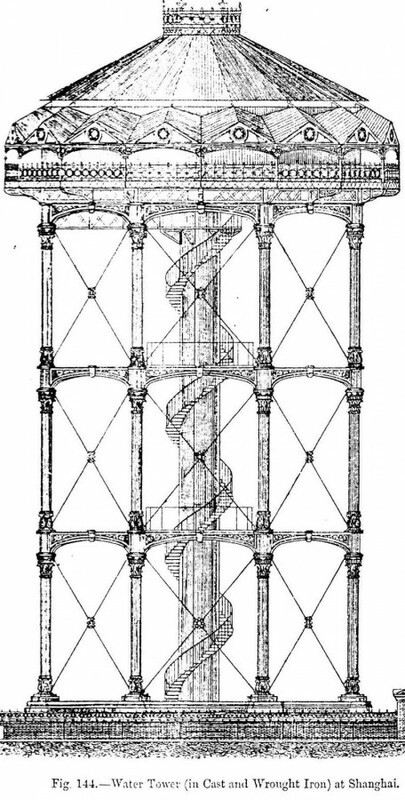 Drawing of the Water Tower found by the British Watertower Appreciation Society. Was the Kiangse Road Water Tower (left) really such a blight on "Shanghai's changing skyline"? I'd rather say Bank of China was. 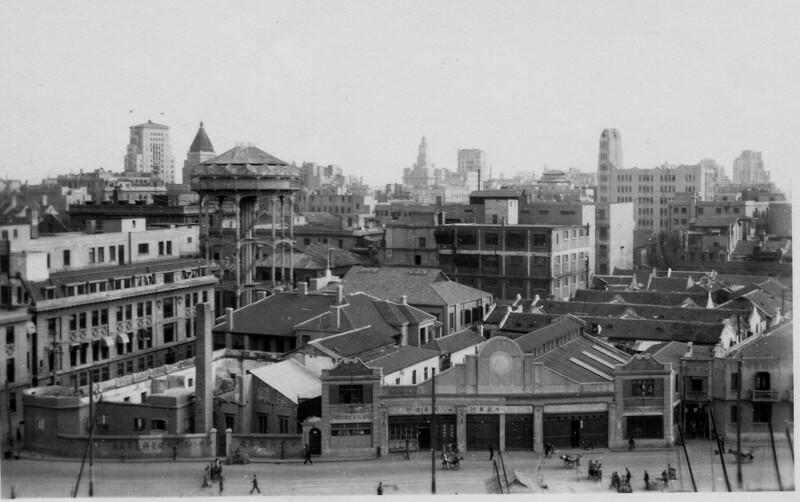 Photo taken in the 1940s from the Embankment Building on the north side of Suzhou Creek. Image: flickr Cities in Old Days. 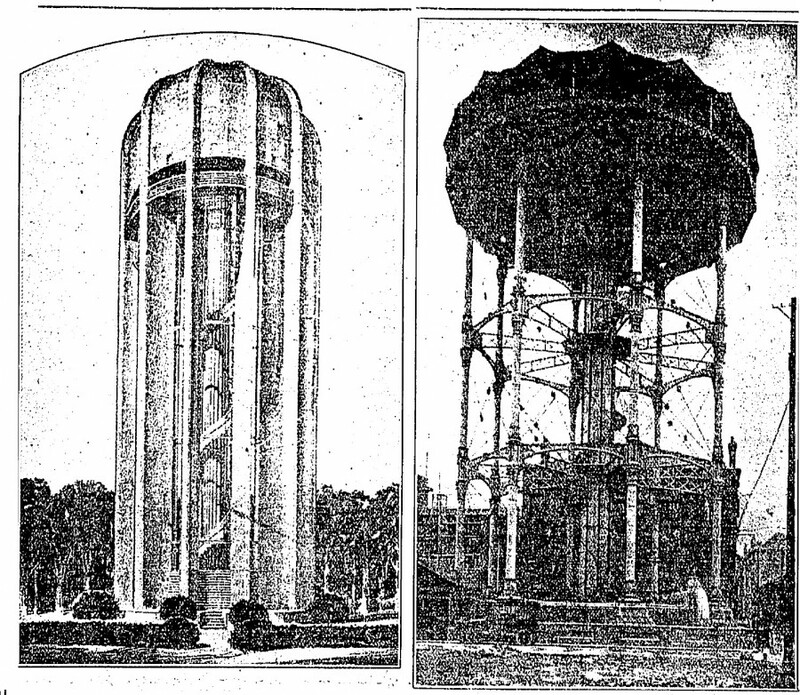 When Shanghai journalists were dissing the Kiangse Road Water Tower (right), they were glorifying Eugene Volta's design for Chicago Water Tower (left). Image: The China Press (June 1932). 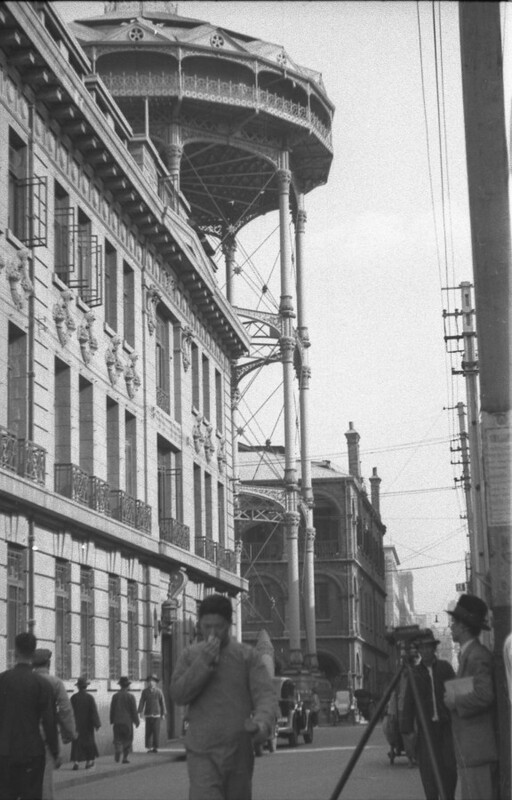 Water tower seen up close and view along Kiangse Road in 1937. Image: Harrison Forman, AGSL Collections at UWM. 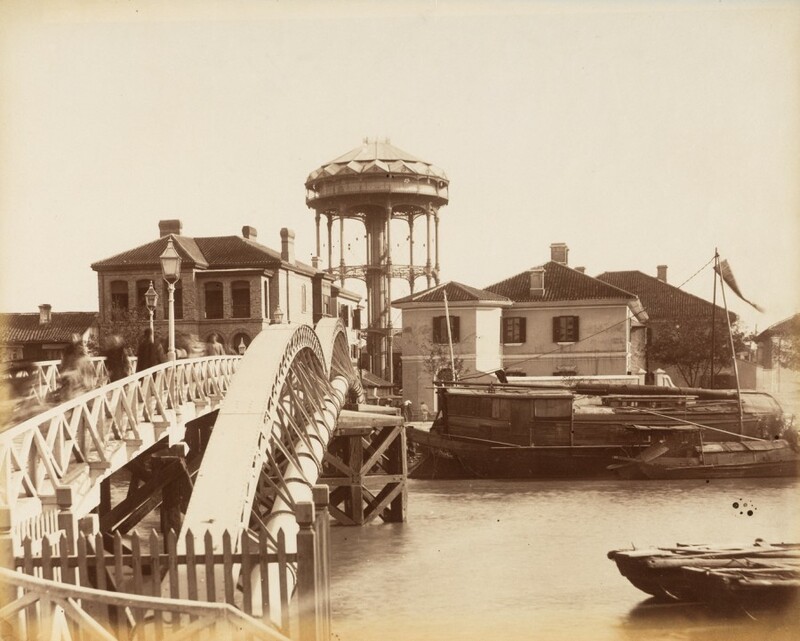 Top: Pipeline across Soochow Creek and the Water Tower, c. 1880. Image: Getty Research Institute. Top image: 高台点灯; Water tower decorated with electric lights for the Queen Victoria's 50th ascension anniversary. Image: Dianshizhai, May 1887. ... was the little Bowling Club on Nanking Road, at No. 49, close to the corner of Honan Road. It was established in 1857 at what was then the outskirts of the city. The club maintained its exclusivity by keeping the membership numbers low; in the 1920s the club still only had 24 members. "Here the game has many patrons among the older generations," as Wright phrased it in 1908. 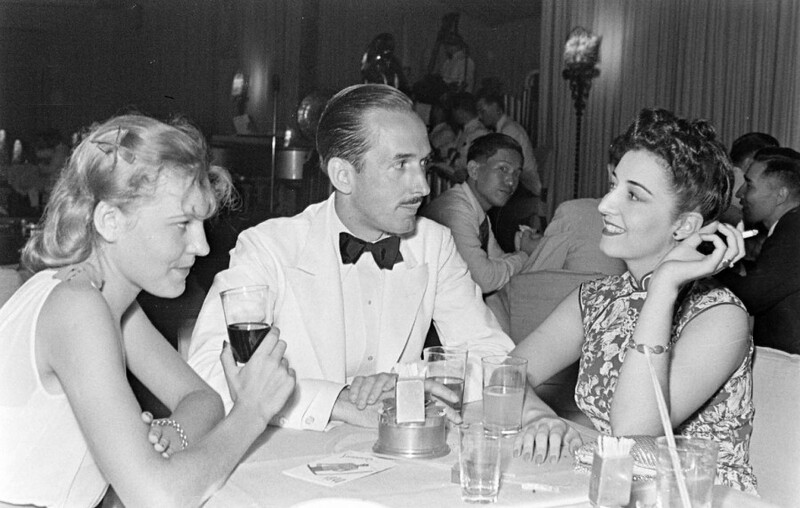 According to the recollections of the Club's members, "whiskey was practically unknown in the club." Instead, brandy and sherry were consumed in enormous quantities. In 1924, the building of the Bowling Alley had "old decrepit walls, the ancient door and uneven steps." 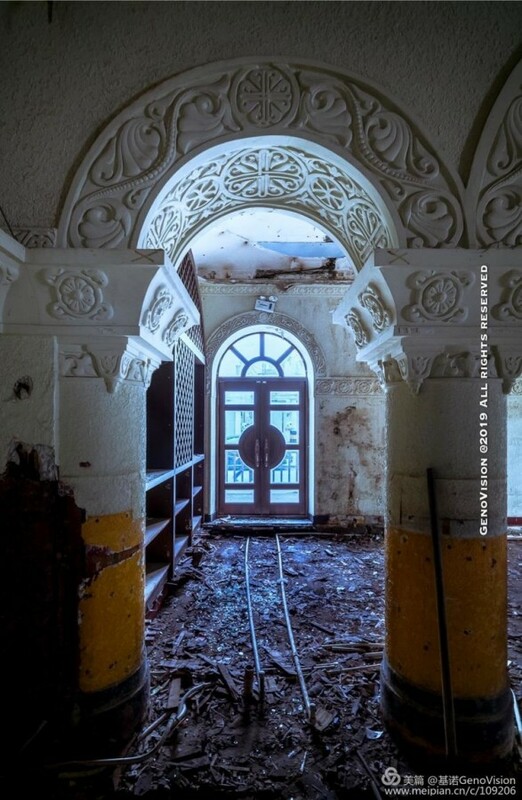 Visitors acknowledged that this "very shabby-looking old building" had "a strange air of reserve and secrecy." This was the last rent-controlled site in the settlement: for seventy years since its inception, the club only paid 25 taels a month in rent. In April 1924, the site was sold to a developer, and one of the oldest buildings in the foreign settlements was mercilessly torn down. 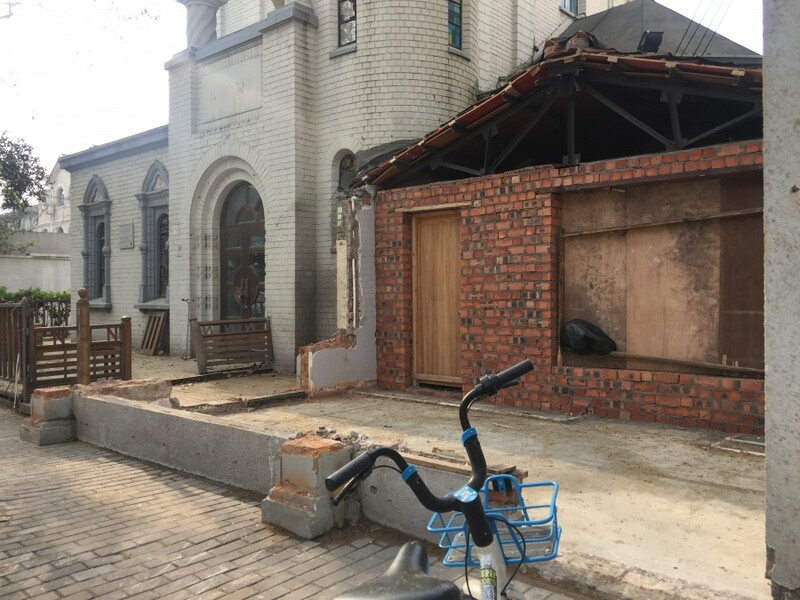 The press lamented: "Old Shanghai is breathing its last breath: old customs have died, old buildings razed to the ground to make way for new, even the old residents have subtly changed." 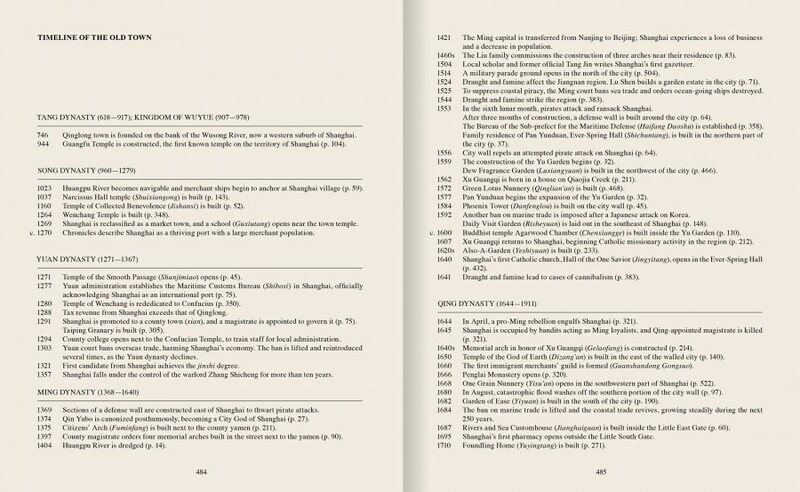 As Hawks Pott mentions in 1928, "although this old historic site has recently been sold and the building torn down, it is interesting to note that the Chinese still call that part of Nanking Road by the Chinese words pau-jeu-dzang meaning "Bowling Alley." In the place of the old bowling alley, a silk emporium Lai Wah Co. (丽华公司) was built. The unassuming building of the Bowling Club, at 49 Nanking Road, near Honan Road 南京路49号近河南路. Image: NCDN Gazette, 1924. 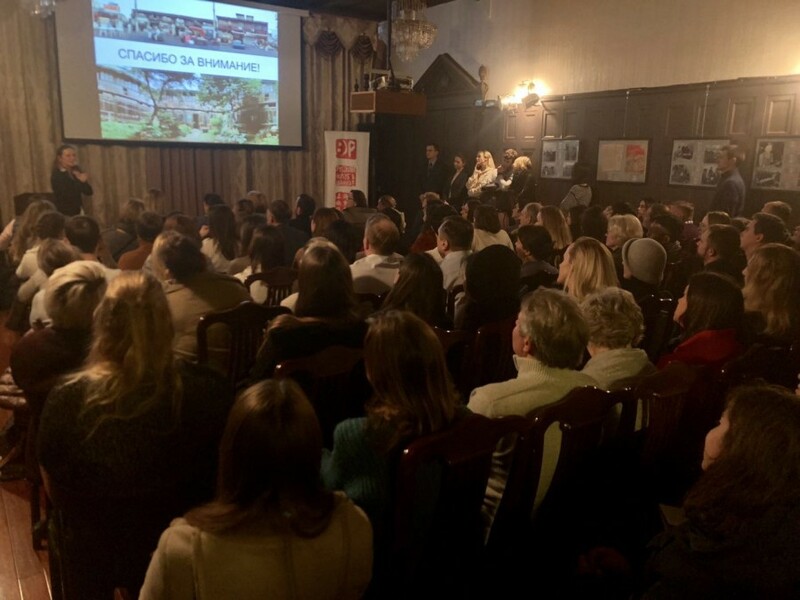 This is from the presentation at the Russian Consulate, organized by the Russian Club in January 2019. Image: Sasha Drozdova. 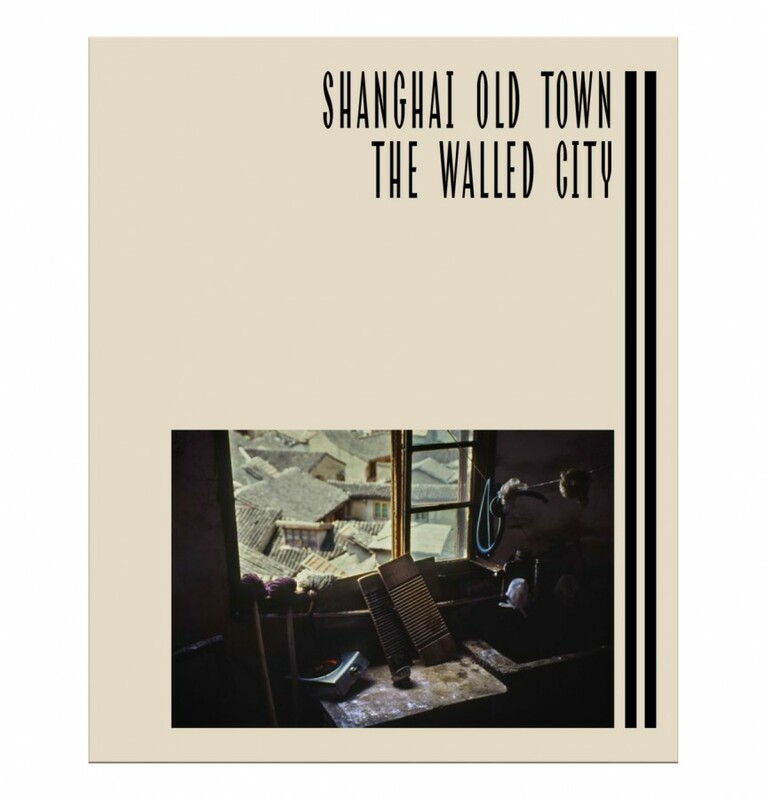 Our book Shanghai Old Town. 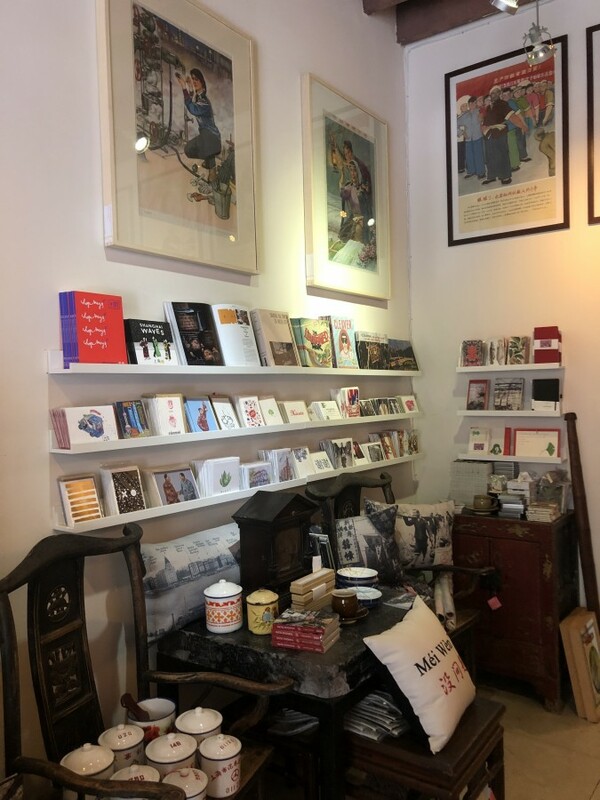 The Walled City on the shelf of Madame Mao's Dowry 毛太设计, 207 Fumin Road 富民路207号. 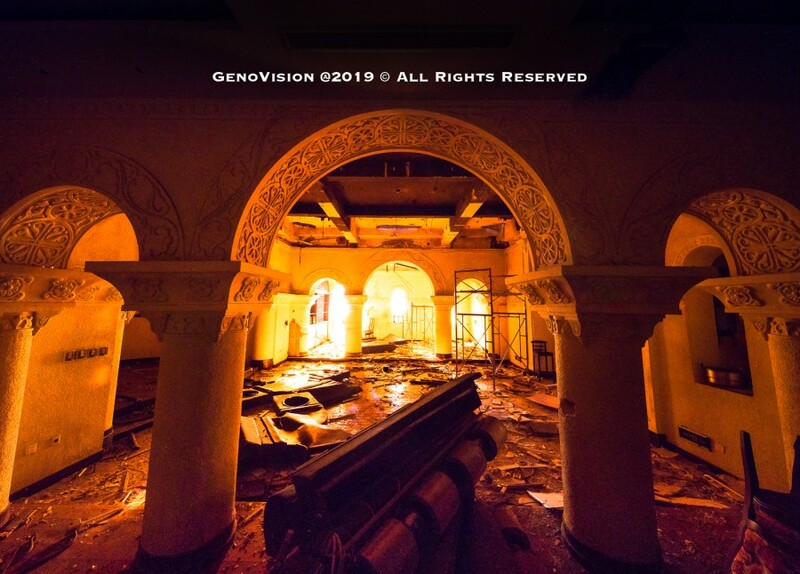 All modern images by GenoVision. 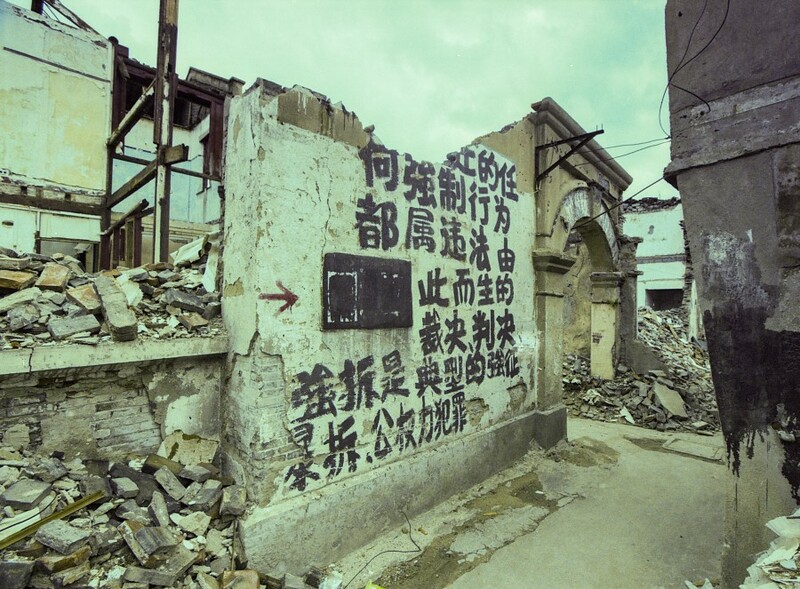 Protest graffiti on the ruins of a wall in Dongjiadu 董家渡, 2011. 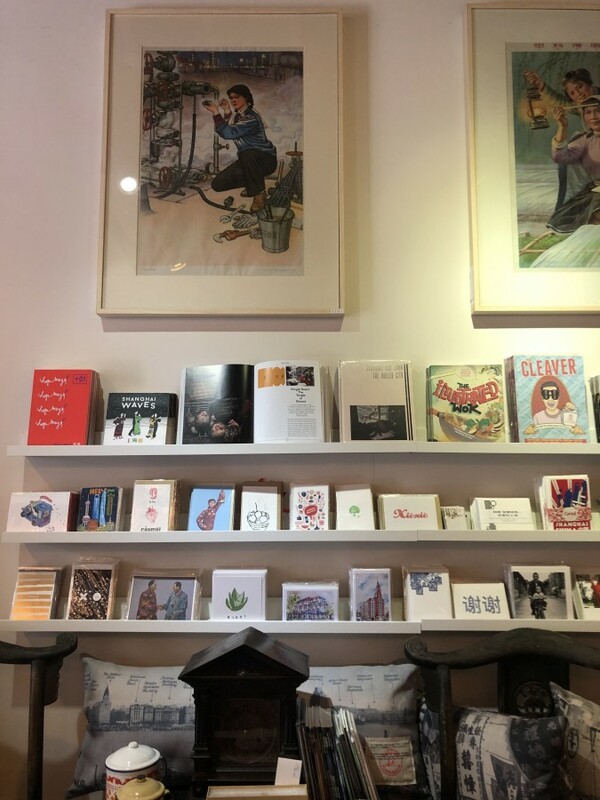 Here is a little Q&A I did for a graduate student of interior design working on the adaptation and reuse of a recently vacated shikumen neighborhood. Are you informed about any plan for this neighborhood's future? I am not informed about that, but I have not been focusing on this area as much as other scholars. In general, in China, there is no transparency in redevelopment schemes. Details of projects, names of stakeholders, demolition and construction timelines are purposefully obscured, to frustrate resistance and improve the bargaining position of the developers. Why lately there have been a deep research and several design proposals in similar Chinese contexts (i.e. 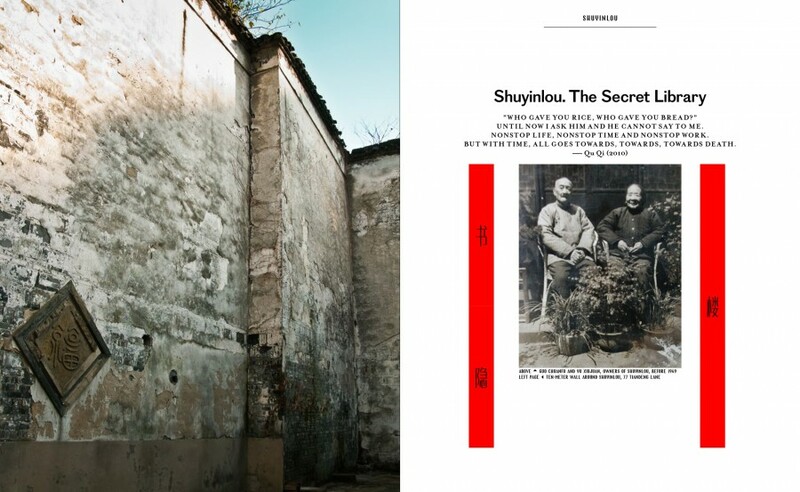 Hutong in Beijing, ShuiWei in Shenzen) but not for Shanghainese Lilong? I would not say Shanghai is overlooked; quite the opposite, it is constantly on the radar of designers, architects and artists. What do you think is essential to create a sense of community and belonging in the Chinese culture? As much as we would like, I do not think we have the power to create these qualities. Sense of community and belonging tend to appear and come to bloom in sustainable, stable communities. 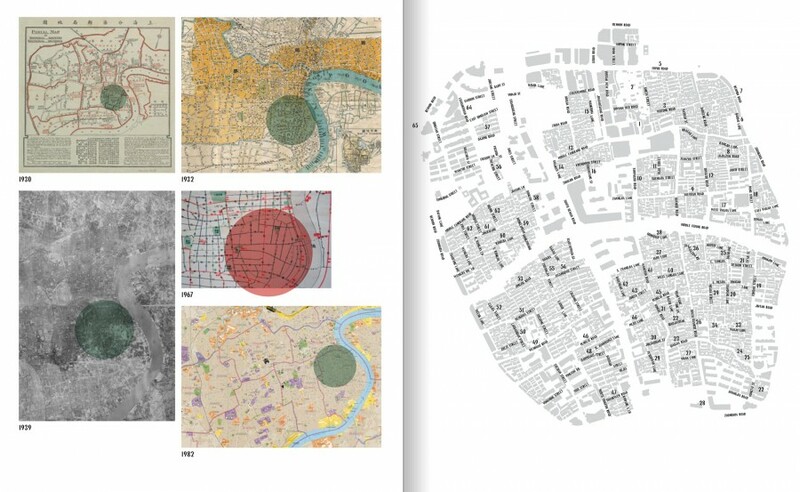 When you look for the expressions of these qualities in spatial domain, you will find they are generally present in in old, established neighbourhoods, with varied architecture, amid small-grain city fabric, with human-scale infrastructure. Which are some spatial solutions that you think must be preserved in Lilong, and in SiwenLi in particular, to create a sense of community? Such approach, once again, suggests a plan to pick apart a lilong, reduce it to some kind of basic structure and to salvage its valuable features. It is predatory thinking in principle. I want the question to be “how not to destroy the sense of community that already exists in lilongs.” And the answer is, of course, to simply let them be. The problem of overcrowding and improved amenities is fantastically simple – it only requires municipal spending. But Shanghai – the richest city in China – would not invest in housing improvements for low-income citizens unless it involves dispossessing them of their homes and cutting them off from the future of their city. 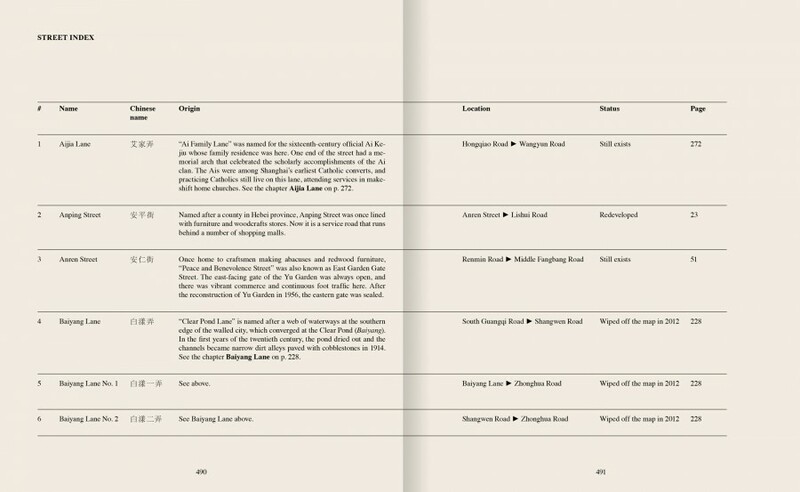 How do you think that the past of this particular neighborhood – and the Lilong’s culture in general – should be passed down to the new generation that is going to use this space? The word “should” is prescriptive and implies deliberate actions. The passing down of urban culture will happen naturally, without our scheming, if the spaces and communities where this culture lives are preserved. In the case of this particular neighborhood, already voided of its citizens and reduced to empty shells of houses, none of its onetime culture will be passed down anymore; it has been conclusively extinguished. Which could be the main challenges in readapting these kind of spaces for the new generation? Lilongs are primarily the places of living, people’s residences, family homes. I believe we should be careful not to barge into someone’s rightful territory with a plan to “adapt” and “readapt” it. How would you feel about someone eyeing your residence and making plans to repurpose it, supposedly for a new generation? When looking at China and working with Chinese cities, we tend to hold people’s property and residency rights in much lower regard than we would in Europe. The main problems with lilongs as places of living are their decrepit state, overcrowding and absence of amenities. But like I mentioned above, this is resolved with municipal investment and optional, case-by-case resettlement schemes, like the ones undertaken in the 1990s in select lilong neighbourhoods in the old town. 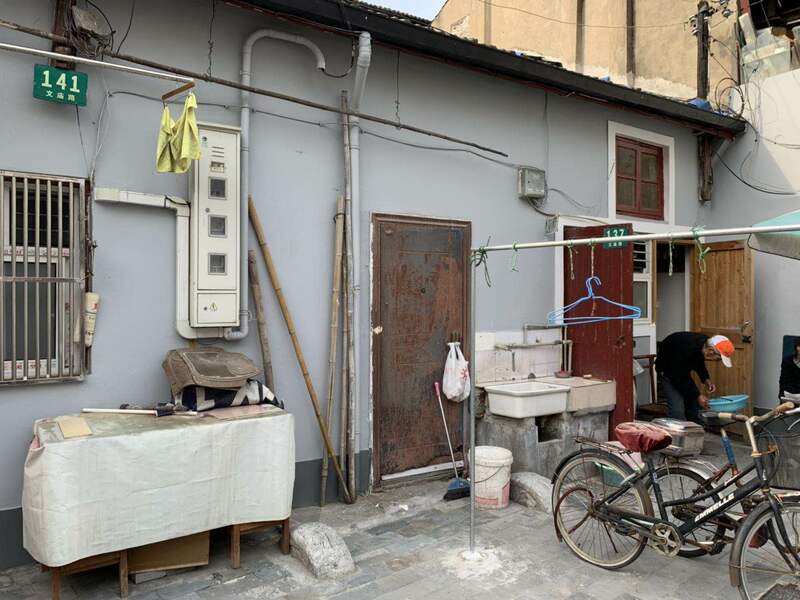 In principle, old housing stock in the city is not an obstacle to “progress” – even though this is what the Chinese authorities and media want you to believe. It is enough to look at any European city to realize this. Which kind of new functions do you image for this particular neighborhood now that is abandoned? This hardly matters. It is a tragedy to see a large residential community destroyed, and I do not wish to dance on its grave.